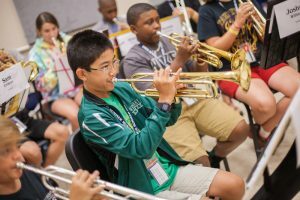 The University of North Carolina at Greensboro is pleased to again announce plans for Summer Music Camp, the largest university music camp in America! This summer we will offer two one-week camps, serving over 2,040 musicians, with programs in band, mixed chorus, orchestra, and piano. 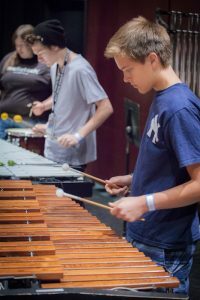 Students at camp are under the leadership and guidance of the artist-faculty of the UNCG School of Music, long recognized as a national leader in musical excellence. In addition, distinguished music teachers, performers, and conductors from throughout the state and nation will join the staff of Summer Music Camp to ensure that each student receives the highest quality instruction available. Ensemble performance in band, chorus, or orchestra will be emphasized and each camp will conclude on Friday evening with a concert for parents, relatives, friends, and area residents. Classes in basic musicianship, as well as recital performances and sectional rehearsals by the camp staff members will serve to balance the total program. A private lesson on your instrument, in voice, or on piano is an available option to all campers. The UNCG Summer Music Camp application process is entirely ONLINE! Parents must make the online application for their child. You must utilize a laptop computer or a desktop computer. Sorry, your tablet or smartphone will not work for the application process! Allow two weeks for the processing of your online application.